Alexander Giannascoli — known as (Sandy) Alex G, formerly Alex G — took to Toronto's Mod Club stage last night as a Rascal Flatts' rendition of "Life is a Highway" played throughout the sold out venue. The evening marked the first stop of his fall headlining tour with Half Waif (born Nandi Rose Plunkett) who treated the full house to soaring, precise electro-pop that never once wavered. Some might recognize Plunkett from her time as a member of Pinegrove, but her engaging and near-perfect set was a warm welcome to the night, and cemented her solo moniker as a portent all her own. Beginning his set with "Whale," "After Ur Gone" and "Judge," Giannascoli and his three-piece band were in pleasant spirits, offering enthusiasm that gave the songs' lo-fi mannerisms a shimmer that further enthralled in a live setting. Straying away from long locks tucked away behind a baseball cap, Giannascoli now wears a plain, shorter haircut. He and his bandmates were clad in buttoned-up dress shirts. There's an inaccessible approachability to (Sandy) Alex G; he is the most fashionably uncool person at his own show. Continuing with "Mary" and "So" off 2012's Trick LP, the tracks were received with urgent enthusiasm, while the millennial Americana of "Bobby" and "Proud" was tastefully twangy. The Rocket recordings showcase elegant fiddle melodies courtesy of Molly Germer, but the missing strings reformulated his understated vocal presence and alluring wordplay. The alt-country side of (Sandy) Alex G recalls desolate nostalgia and an upsetting familiarity; like the soundtrack to a Disney movie you liked but went on to forget about. The rapport of a (Sandy) Alex G show is often a coin toss. Is he the quirky Bandcamp prince of indie rock that will crack jokes throughout the set, or will he assume the role of brooding singer-songwriter who frowns about radio play and yells at his crowd for talking loudly? The unpredictable behaviour and artistic restraint often made his crowd project. Members of the audience crowdsurfed during an instrumental interlude, all while Giannascoli had his back turned on the herd. "I feel like I get worse at the guitar as I get older," Giannascoli clowned before "Kicker." He continued to manoeuvre about the stage during "Boy" and "Bug" with his infamously awkward waddling strut, but he and his bandmates genuinely seemed happy to be there. 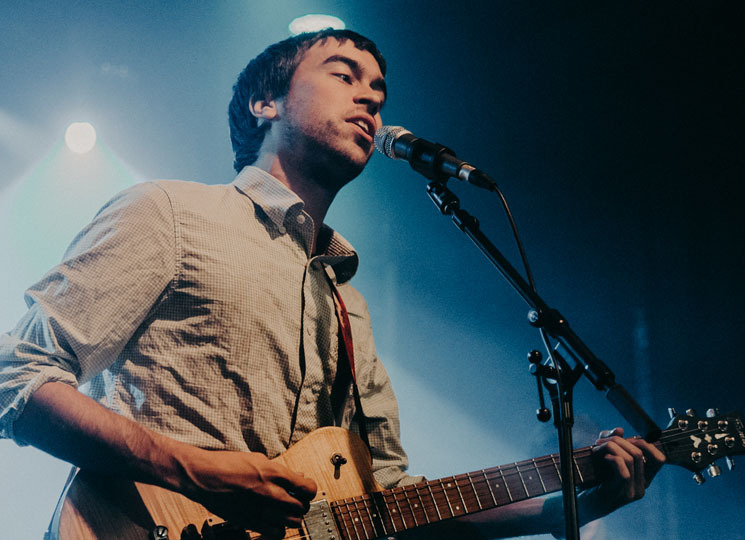 The pinnacle of (Sandy) Alex G's energy was the visceral and experimental "Brick," which saw Giannascoli exiting instrumental duties to sprint across the stage several times as he screamed his calloused vocal parts. For a moment, the Mod Club detoured to a Death Grips show. "We are going to do the whole walk off, you clap loud, we come back thing," Giannascoli prefaced for those unfamiliar with encore mannerisms. Bandmates in tow, he returned to play a velvety, well-received rendition of "Brite Boy," followed by "Animals." Making his way towards the crowd to exchange high-fives with the first few rows, he asked what else the audience would like to hear, opting to leave on a high-note with "Gnaw," ratifying what was (Sandy) Alex G's sharpest and most animated Toronto performance to date.